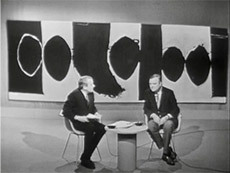 Motherwell discusses the ethical character of art in this segment of the 1964 public television program ART: New York. 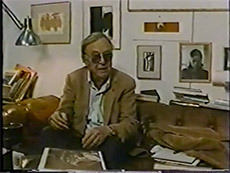 Motherwell discusses children’s art and the question, “when is a picture finished?” in this clip filmed in Greenwich in 1988. 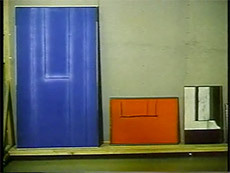 This footage was filmed in Motherwell’s Greenwich studio in April 1970. 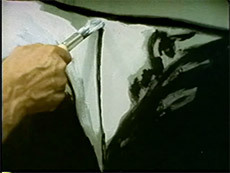 Motherwell discusses his faith in painting and the “attitude towards reality” which defines his aesthetic, against a backdrop of scenes filmed during the installation of his retrospective exhibition at the Solomon R. Guggenheim Museum, New York in 1984. 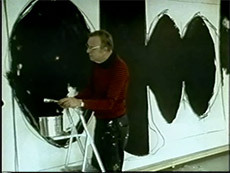 Motherwell discusses the legacy of Abstract Expressionism and is seen painting Elegy to the Spanish Republic (with Lemon-Yellow Panel) (P648) in his Greenwich studio in 1971. Motherwell discusses the Elegy to the Spanish Republic series and paints Elegy to the Spanish Republic No. 124 (P650). 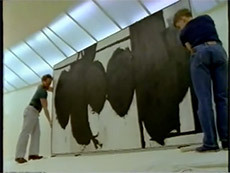 This scene filmed in his Greenwich studio in 1971.